Instructions: Card is 6 x 6". Score and fold 12 x 6 white cardstock at 6" on the long side. Cut a 6 x 6" card front from the paper collection, ink the edges with cobalt blue ink and adhere to the card base using dries clear adhesive. Cut coordinating 6 x 6" panel from the paper collection, trim to 5 5/8 x 5 5/8", ink the edges and adhere to the inside of the card. Using the Cut Mat Create 2A die, cut out the center of the card front and ink around the edges of the aperture. Stamp the Patchwork Pocket on yellow cardstock using cobalt blue archival ink and diecut using the coordinating die. Adhere to the card base as shown using dimensional dots. Stamp the buttons on white cardstock using cobalt blue and berrylicious inks, diecut using the coordinating die and spray with Sparkle Sheer Shimmer Spritz. 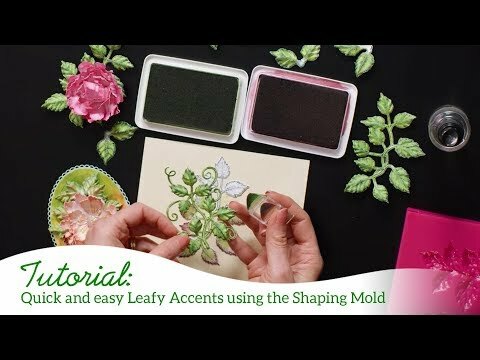 Stamp the Leafy Accents leaves on white cardstock using Archival Olive ink, color with the same ink and berrylicious ink, diecut using the coordinating dies and shape using the Leafy Accents Mold. Sponge with dries clear adhesive and sprinkle with Rajni Chawla's Crystal Clear glitter. Stamp the blue blooms from the Buttons and Blooms stamp set on blue cardstock using Archival Cobalt Blue ink. Stamp the pink blooms on dark pink cardstock using ColorBox Berrylicious ink. Diecut using the coordinating die, shape using the Deluxe Flower Shaping Kit and spray with Sparkle Sheer Shimmer Spritz. 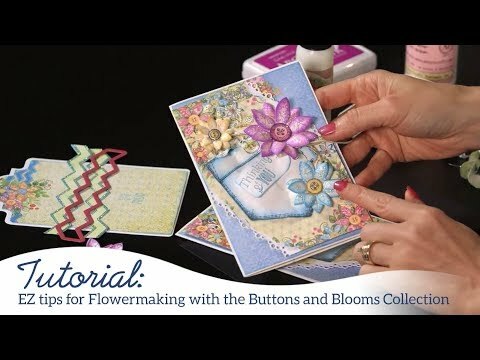 Add the diecut buttons to the flower centers and the pocket using a dimensional dot. Cut the sentiment from the paper collection, lightly curve and adhere to the card base using dries clear adhesive.